But what I’ve learned through the experiences is that the best way to prepare for travelling with an infant is to know what could happen. So what are you in for? This is the law of car travel. Dropped items may include (but are not limited to) dummies, bottles, stuffed animals and shoes. All will require you to reach behind the seat to retrieve them. The best way to overcome this problem is to travel with a partner (or helpful older child) who can focus on item retrieval while you focus on the road. Even if you fed him 15 minutes before you left, he will be hungry. 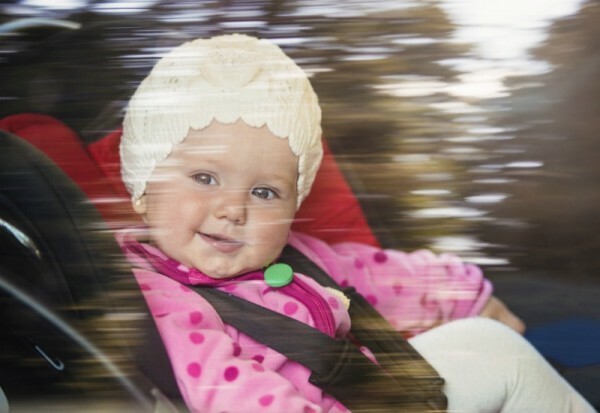 At one point on your journey, you can expect to be parked on the side of the road,, crammed into the front seat with a baby attached to your breast (or bottle) and a foot in your face. Will it be vomit? Or wee? Or maybe a triple threat Number Three nappy? Pack extra clothes, extra nappies, extra towels and extra wipes and hope for the best. You will be left debating whether to wake him or to simply sit at the destination and enjoy the silence. I would suggest the latter. No matter how many times you repack and how many lists you make, when road tripping, especially with an infant, you will forget something. My money is on your phone charger. Or the dummy. Especially if your baby can crawl or walk. Prepare for your little one to want to explore every single nook and cranny of this new, not very clean area. Hopefully it tires him out for the flight ahead. From a safety point of view, the infant seat belt, which attaches to your own on take off, landing and turbulence, is crucial. Comfort wise, it is a struggle, especially when you have a wriggly infant who would much rather look around, smile at the passengers over the seat behind you and crawl up and down the aisles. Trying to manoeuvre a sleeping infant in your arms with a meal served on a tray table is pretty much impossible. Your best bet here is to ask the person beside you to have compassion and spoon feed you. Because there really isn’t enough room for one person, let alone two, especially when one is trying to squirm away. Don’t try to change your baby at your seat though – at least, not if you want to stay friends with nearby passengers. Like in the customs’ line (and there is no way you are losing your spot!) or as soon as the seat belt sign comes on. There is always going to be at least one person on the plane that is having a bad day and decides that it is your fault. But for every dirty look, you will get at least 10 smiles, especially when your little one is crawling up and down the aisles with the biggest grin on his face! Focus on this. So how can you ensure the smoothest ride possible, regardless of your mode of transportation? Mentally prepare. Pack smart. And remember, you won’t in transit forever. Soon you will arrive at your destination, hopefully with a cocktail or coffee waiting for you, and perhaps grandparents eagerly on hand, just begging to spoil their grandchild and give you some much needed recovery time. Prepare the nappy bag with plenty of extra nappies. There is nothing quite as awkward as running out mid-flight. For a limited time, you can test drive BabyLove Crawler Cosifit nappies, which are designed for crawlers on the go. So, whether you are at home, on the road or up in the air, you will be ready for the journey ahead.